Like most kids, my tot loves oreos. As he has older cousins, it was inevitable for him to discover the world of oreos sooner or later. When he goes to his cousin's house, that's a special treat he looks forward to. As he's getting older, I have to give in time to time. 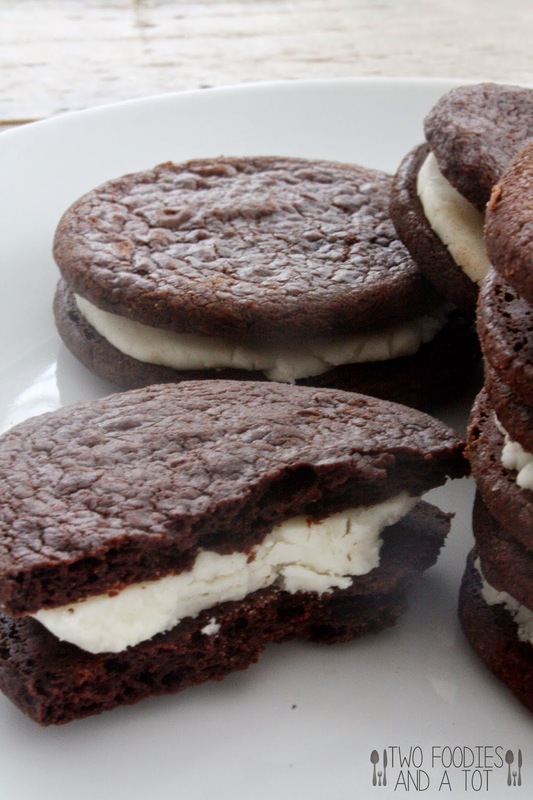 Steve and I love anything chocolate, especially oreo type of cookies, so I just decided to make some at home. It's funny how Steve and I both scrape off the cream when we eat them, and Steve had his paws on the cooling cookies way before I even got to assemble them. And I got a special request that I had to keep a lot of non assembled cookies aside for him. Even though I scrape off the cream and not eat it, I still find it tastes more like oreos when the cookies sits with the cream. I think it probably absorbs the flavor from the cream and makes it taste better. I have to be honest, I was tiny bit disappointed that it's not EXACTLY like commercial oreos but it's pretty darn close. It's crunchy and chocolatey but something about commercial oreos I can't explain seemed to be missing. But knowing exactly what's in it, it's definitely worth it. And when the wafer part is crushed it tastes just like chocolate crunch so it will be useful when I make ice cream cake in summer because Steve's favorite topping for ice cream cake is chocolate crunch. Consistency and taste of the cream filling is actually just like what you get from oreos which really surprised me. 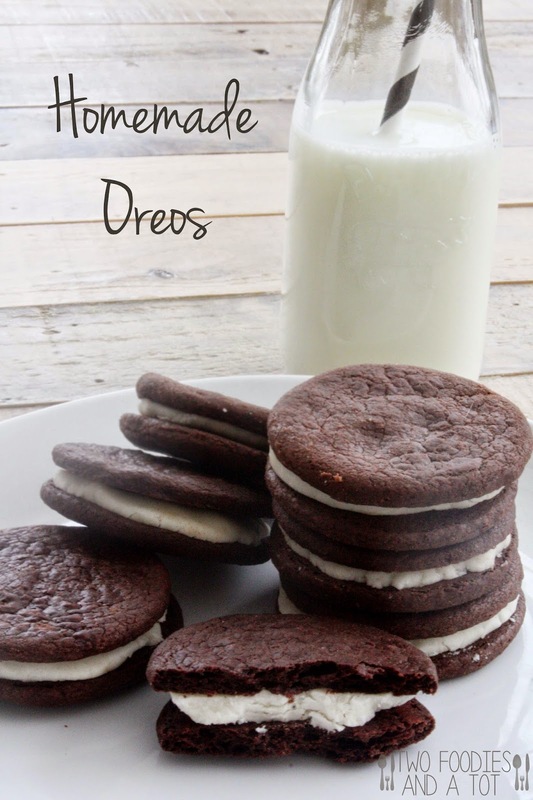 I have tried a couple of different oreo recipes and this is by far the most satisfying one. Makes about 3 dozen cookies with the cutter I used. 1. Cream butter and sugar for about 2 minutes, until fluffy. 2. Add cocoa, salt, vanilla and mix until incorporated. Add half of the flour, mix and add 1/4 flour at a time until you get a pretty dry dough. 3. Divide the dough into 3 disks, wrap and chill in the fridge for an hour. 4. Preheat the oven to 350F and roll out the dough thin, cut out to shape you want and bake for 8-9 minutes. Cool on the wire rack. 5. Make the cream filling while cookies are chilling. Add all the filling ingredients to a stand mixer with a paddle attachment and cream them. If you need, add 1 tsp of water at a time until you get a play dough like consistency. 6. Make them into a log that's appropriate size for size of your cookies. Wrap and chill in the fridge until ready to assemble. 7. When the cookies are chilled, slice the filling into thickness you desire and assemble the cookies. *Recipe from Bless this mess.